Brand looks to provide mix of value and content. 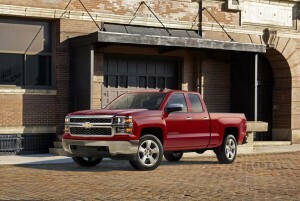 The new 2015 Chevrolet Silverado Custom gives buyers an affordable mix of amenities and value. The drop in gas prices has helped spur sales of full-size pickup trucks, but Chevy is looking to carve out a niche in the segment – nice, but not too nice – with its new Silverado Custom introduced at the Chicago Auto Show. Based on the popular double-cab Silverado LS, the Custom package adds 20-inch aluminum wheels, chrome bumpers, a body-colored top cap above the front bumper, and chrome mirror caps and door handles. It also features four full doors for easier access to the front and rear seats, a 40/20/40 cloth front seat, tilt steering wheel, cruise control, power windows and door locks, and Chevy MyLink with 4G LTE WiFi. While making the truck more convenient on the inside has been the trend for the better part of the last decade, the heart of any truck is still the engine and Chevy gives Silverado Custom buyers are couple of options. 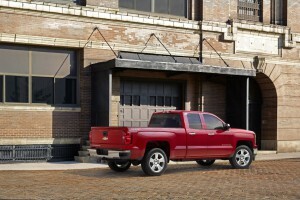 The new Chevy Silverado 1500 Custom rounds out the brand's full-size pickup line-up. Chevy claims most buyers will select the 5.3-liter EcoTec3 V8 that puts out 355 horsepower and gets 23 mpg on the freeway: the best in its class, the automaker says. The other option is the smaller 4.3-liter EcoTec3 V6. Both engines use direct fuel injection, continuously variable valve timing and Active Fuel Management, which enable four-cylinder operation during light-load driving for improved efficiency. Expect to keep their trucks for a long time. Want a truck that is as dependable as they are. Prefer a stylish exterior and a clean, functional interior. Want a vehicle that will be easy to maintain and inexpensive to repair. When equipped with the available 5.3L EcoTec3 V-8 and color-keyed carpeting, both expected to be popular choices, a two-wheel drive Silverado Custom starts at $33,820. A similarly equipped 4×4 starts at $37,800. Dealers can order Silverado Customs starting this month.